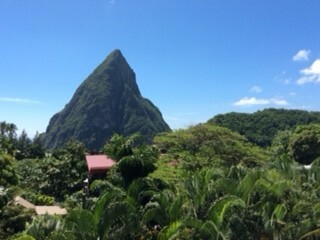 You are here: Home / Luxury Resorts in the Caribbean / Congratulations to these Saint Lucia Resorts! Saint Lucia (situated in the Windward Islands of the West Indies Lesser Antilles)consistently ranks as one of the favorite destinations in the Caribbean and thanks to the most recent awards bestowed upon this beautiful island the popularity will just continue to increase. Conde Nast Traveler Readers’ Choice Awards for 2015 were just announced and in the grouping ‘Top 40 Resorts in the Caribbean’ many of my clients favorites made this list. The rankings within this category are based on the views and opinions of travelers. Saint Lucia captured the Number 1 position with Jade Mountain and five other resorts made the ‘Top 40″ list as well including Ladera Resort at Number 4, Sugar Beach a Viceroy Resort at Number 5, Cap Maison at Number 21, the Body Holiday at Number 22 and Anse Chastanet Resort at Number 30. Based upon the views and consumer choices the island of Saint Lucia nabs the #18 position amongst the islands of the world ! Saint Lucia is known for its natural beauty including the signature Piton Mountains (a UNESCO World Heritage Site), a tropical rainforest and one of the world’s few drive-in volcanoes. Quaint fishing villages dot the coastline, a wide range of accommodations range from luxury five star resorts to value-oriented properties and the annual Saint Lucia Jazz Festival all contribute to Saint Lucia’s growing popularity. This was our fourth visit to Rendezvous in as many years. Each previous time, we have returned full of praise for the staff but with a few niggling points of constructive criticism that had added a small tarnish to the shine. However, each of those few points have been addressed by the hotel and there was now absolutely nothing to fault. Sunshades, albeit canvas ones, had even been introduced among the substantial thatched ones, enabling guests to avoid an early morning scramble to reserve loungers under one. The food is of a very high standard and the soups, particularly the callaloo, are excellent. However, the major asset of the hotel has to be the staff. At all levels, everyone has a ready smile and an eagerness to talk to you. It’s a positive delight to spend time with people such as Louvina, Ingrid, Jackie and Ryan. Of course, this probably stems from the hotel’s leadership, so well done Yhasmine and our very best wishes for your forthcoming second big event. Thank you all and congratulations for adding again to our excellent holiday experience. We have already booked for 2016!